Highway 5 – Fresno to Sacramento. to the house. He’s been there since March. that Rusty needed more than food and water. an ugly festering thing that bleeds and smells. His owner said, get that dog the hell outa here. in the desert outside LA. She couldn’t. just hoped the strangers who approached wouldn’t kill her. nobody knows his name. He answers to anything you call him. He’s just glad to have somebody call him at all. Then he can stop hurting and pretending he’s okay. so they sure as heck can’t keep Digger. on a sleeve, and Digger stopped wagging his tail. Trixie wasn’t sure if she even was a Golden. she’s got more cocker than retriever in her genes. We gave her the benefit of the doubt. will be mighty glad to have Trixie at her house. Those two over there are Sam and Isabella. Brother and sister, been together all their lives. but Nobody never asks whether dogs’ hearts break. for cranky old bones to settle down and sleep. so he can walk again, chase tennis balls and play. Doc here will give him everything he needs. Somehow we’ll pick up the tab and save the dog. To the world we are dog rescuers, but to these dogs, we are the world. Please join us! This was one helluva moving poem… I am still scared of dogs (have always been).. but I ain’t cruel to them… I just stay away from them, never ever hurting them! Too afraid to do that! But this poem sure brought a lump in my throat, and welled up eyes with tears! Every animal deserves to live well, no matter what, and NOT have their hearts broken! And you are doing an AWESOME job at giving them the life they need… Bless you for that, Cindy! You are too kind and sweet! A heartrending poem… phew.. but very hopeful and positive too (thanks to you!).. I’m just a pt. time volunteer driver and foster parent for old goldens (one at a time); the real heroes are the folks who run this organization, Jody and Mike and the team of full-time and part time volunteers who do so much for the love of a dog. Each time I bring a van load of dogs back to the sanctuary, I’m struck by the patience of these wonderful animals, their trust in us, and the joyful faces and loving arms that greet the dogs and help them get settled in their new home while forever homes are found for them. Every time I pull in the drive, I choke up with happy tears, knowing nine more dogs, or six more, or (last Saturday) fourteen more are safe. Anyone who is interested in donating or volunteering can find out more by visiting their website: http://www.hbgrr.org. Thanks so much for your kind heart and response. Thanks for One Shot. I like having another source where I can read other writers’ work and post my own. You’ve done a nice job with your site. so glad you took care of this dog – golden retriever’s are my favorite dogs – so “Lucky” you found him.. Thanks for visiting and commenting, Claudia. I visited your blog and read some of your work – nice stuff! I like your oh-so-easy to fall into the scene writing. Tried to leave comments on your blog but kept getting an error message. Put your site on my blogroll too. Look forward to reading more. Cheers. Cindy, I too faced some problem while trying to leave comments on blogs at blogspot, using my WordPress Open ID credentials. I guess they are having some trouble there.. So maybe you should give it a shot too.. who knows.. it might just work.. Thanks for the tip. I’ll try it. In total agreement about tech troubles. Grrrr. Thank you heartspell. I visited your post as well – sobering, difficult yet beautiful stuff. Put you on my blogroll too. Looking forward to following your work. Thanks for your kind comments and heart. i am glad there are people with hearts to take care of these animals…it makes me sick those that abuse them…when there are those that would love them. thanks for linking up to one shot! Thankfully, the majority of dogs we rescue aren’t so much abused as abandoned, whether willingly or due to circumstances out of the owners’ control. Many puppies are surrendered after the family realises how much care they need and more mature dogs handed in due to relocation, family split-ups, or medical reasons. I fostered a 13 year old until he died at 15 and a half. His family had to surrender him because their blind child needed a seeing-eye dog for going to school, and other pets are not allowed in the home of a working service dog. It broke their hearts, but lucky for him and especially for me, he found a good retirement home through Homeward Bound, and now when I drive the Golden Taxi, I feel his spirit riding there, right beside me, telling all those dogs not to worry – they’re on the best ride of their life. Thank you, Desert – in the same way your poetry speaks of longing for ‘his touch’ dogs long for ours. Not sexual, of course, but soulful. Long removed from their days of wild, breeding and cell memory have made them man’s perfect partner – they live to please us, and they need us to survive in today’s world. All too often we let them down, yet they trust us again and again and again. bittersweet in it’s loveliness, this one. My heart breaks for these dear souls who only want to bring happiness into the lives of those fortunate to own one. We almost lost our Goldie last year – one day the Vet was going to put her down and a few days later she rallied back. I think she willed herself to live for us. So glad to hear she made it back and lives to tell the (okay, I won’t say it) tale. Give moon’s doggies a wag from Libby (13 yrs Homeward Bound Golden). We need more then compassion here we need people to help and respond. You are doing a wonderful job in posting getting the word out and the rescue efforts, I cannot thank you enough for your work. Joanny, thank you. You got straight to the point – we need people to help and respond. Sympathy and sorrow should be more than indulgences that allow us not to feel responsibility. To really make a difference, we must go beyond sorrow and be part of the solution. ; to get up and do something, give something, say something – anything we can do – to work towards a better situation. This is one reason why I love Homeward Bound and the work they do. They never see anything as insurmountable problems; they see only opportunities for finding solutions. And find those solutions? They do – every day. Last Saturday when I arrived at the pick-up point in Fresno, a stranger came over and handed me $10 towards gas money (it takes $50 to fill the tank). She had tears in her eyes – tears of sorrow, but with the $10, she created joy. Joy for 14 dogs, because she helped to bring them home. Joy for me because I saw the simple generous act of one person raise my belief that human beings are truly beautiful, and under their skin, they have hearts as big as those golden dogs we rescue. Thank you so much for seeing the point. Thanks for your support, and thanks everyone else who responded today. 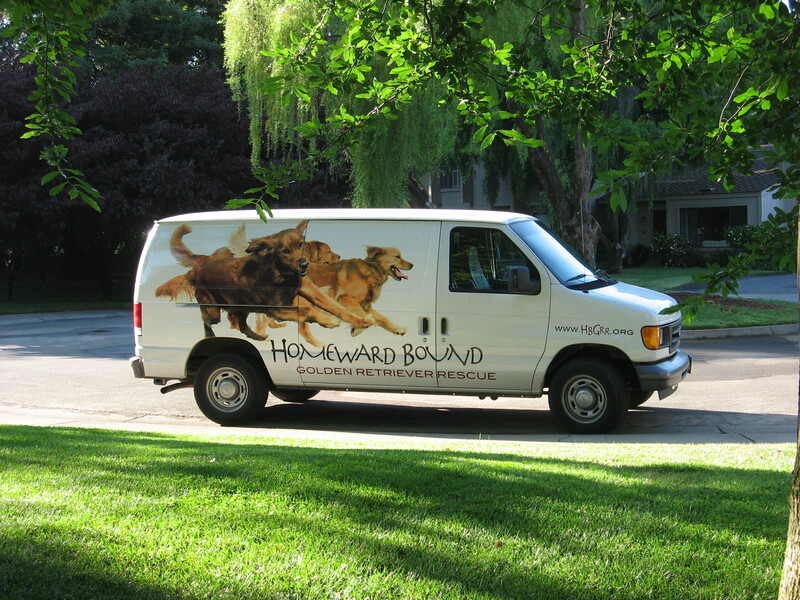 On my homepage, there is a direct link under Organizations to the Homeward Bound website. Please ‘drop in’ and and have a read. Meet the dogs up for adoption or fostering. Sign on as a volunteer, buy a T-shirt, a coffeemug, or remind a friend who lost their beloved dog to death, that the best cure for grief is to help another dog. Support your local sanctuary and be responsible for your pets. Thank you – today I truly felt your hearts and they were full of love. This just broke my heart. Thank goodness there are kind people like you to gather them close and make sure that they get the love and attention they deserve. Thanks Pete. By your photo today, it looks like you went to a beautiful place for your week away. Nice pic! This just made me cry, not in a bad way. Just a sense of those nine dogs, who they are, their history, their future…this may be my favorite one of your poems so far. I’m going to send it to my son who is a vet tech. I think it will touch his heart. I loved the image of the old dogs resting on the couches and beds. So sweet.